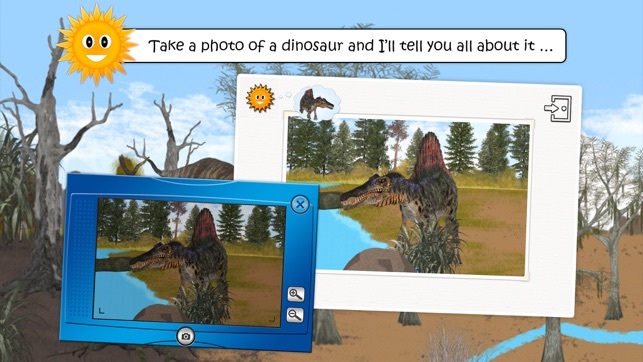 The same collection that brought you our "Find them all: looking for animals" game has a new addition: the long-awaited world of dinosaurs! 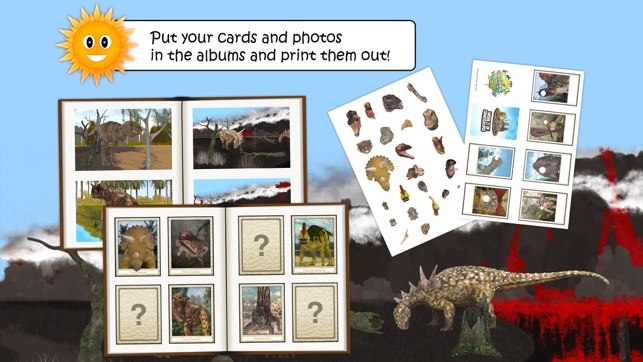 - Search for dinosaurs in their habitat and win animated cards. 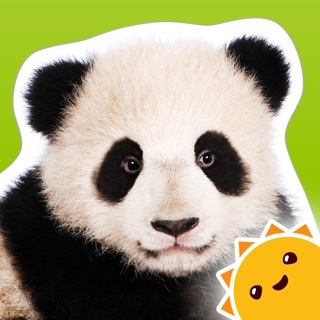 - Take photos and listen to information about your favourite animals. 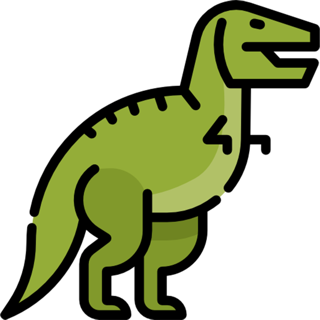 - Find all the dinosaurs before nightfall...or use a torch to find them in the dark. 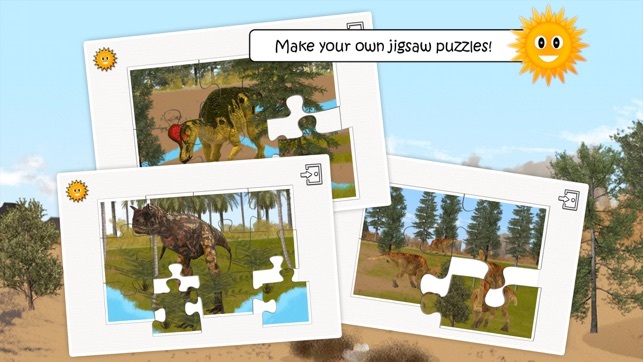 - Make jigsaws from your photos (4, 6, 12, 24, 42 pieces). - Play a photo quiz and try to win new snaps for your album. - Find the cameraman and he’ll show you a video! You can even print your cards and photos from the albums! - Spoken assistance and instructions (French, English, Spanish, German). - Introduction to languages: the animal names are available in four languages. 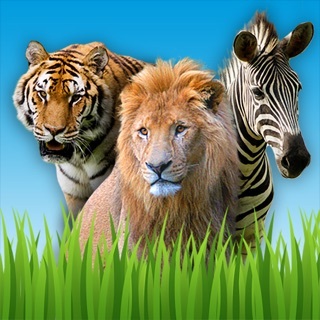 - Each round is different (different settings, animals and positions in every round). - Brachiosaurus, Euoplocephalus, Gallimimus, Iguanodon, Microraptor, Spinosaurus, Stegosaurus, Tyrannosaurus, Triceratops, Velociraptor, Bambiraptor, Carnotaurus, Citipati, Corythosaurus, Dimetrodon, Elasmosaurus, Lesothosaurus, Pachycephalosaurus, Parasaurolophus, Plateosaurus, Protoceratops, Pteranodon, Sauropelta, Styracosaurus. 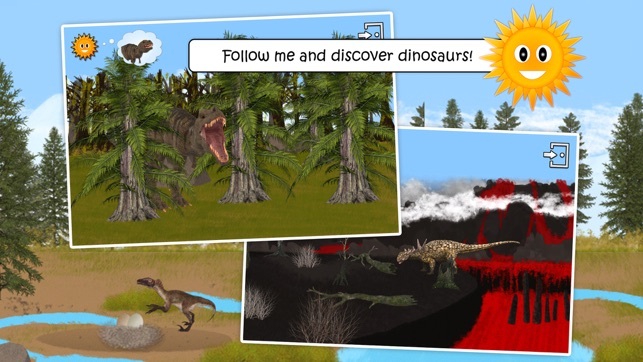 - Altirhinus, Amargasaurus, Ankylosaurus, Archelon, Arthropleura, Ceratosaurus, Desmatosuchus, Dimorphodon, Diplocaulus, Eurhinosaurus, Kentrosaurus, Liopleurodon, Masiakasaurus, Megalodon, Meganeura, Microceratops, Nothosaurus, Olorotitan, Pentaceratops, Placodus, Pterodactylus, Tanystropheus , Therizinosaurus, Torvosaurus. - Allosaurus, Archaeopteryx, Centrosaurus, Compsognathus, Dilong, Dilophosaurus, Diplodocus, Estemmenosuchus, Giganotosaurus, Gigantspinosaurus, Lambeosaurus, Maiasaura, Majungasaurus, Mononykus, Ouranosaurus, Pachyrhinosaurus, Prestosuchus, Psittacosaurus, Quetzalcoatlus, Rhamphorhynchus, Stegoceras, Suchomimus, Torosaurus, Udanoceratops. 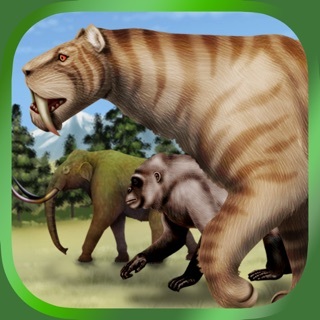 - Mammoth, Woolly Rhinoceros , Cave Lion, Brontotherium, Deinotherium, Doedicurus, Macrauchenia, Paraceratherium, Smilodon, Daeodon, Uintatherium, Arsinoitherium , Cronopio, Eohippus, Phorusrhacos, Arctodus, Darwinius, Megatherium, Platybelodon, Titanoboa, Acherontisuchus, Megaloceros, Hyaenodon and Caveman! Please visit http://www.find-them-all.com or http://www.facebook.com/FindThemAll for further information. This is an awesome app! My 6 year old loves it!! Great pictures! Very interactive! He has learned many new animals from this game. The Dino sounds are fun too! Update... Still one of the best apps in the app store. I just downloaded this app after a long anticipated wait by my three children. Two things happened. First, it loaded as a completely separate app, instead of a new world within the already established app. And the sound was unavailable in both apps, plus I lost the sound in several other apps as well! I had upgraded the Find Them All original app at the same time, and that could have been it, but until I deleted both apps and reinstalled them, I had NO sound. 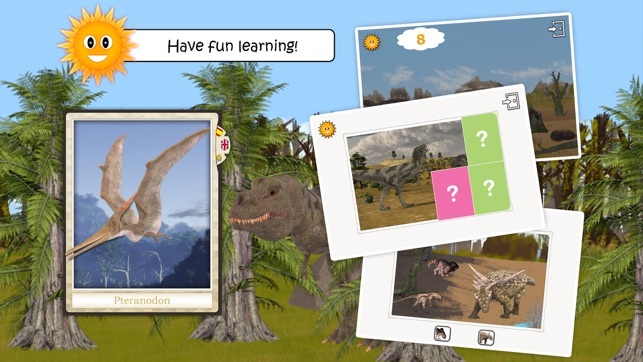 Why is the dinosaur world loading as a separate app, and are you going to fix this bug? Thank you for listening in advance, as the kids really do love this game and you've done an excellent job on it. We are looking forward to the next new world in June! 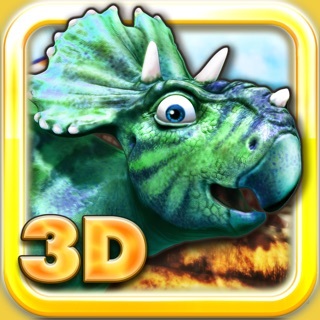 When I purchased the "Find the Dinosaurs" new app for my grandson to play, it didn't load in correctly within the original game, but loaded as a completely separate game app. on my I-Pad. This has never happened before and I have purchased all the available apps for this game. Help!?? I'm hoping you will be quick to fix this or will definitely not plan on buying any new apps for this game.